Keyword analysis is the first step in keyword research of competitors. Understanding the competitive landscape of your content will help you to identify keyword opportunity gaps and find new content topic niches. Not only will it make a big difference in your SEO strategy but also give valuable information for your SEM and PPC campaigns. Your brand or topic might be in an unsaturated niche industry, which makes it easier for your keywords to rank. But for most businesses out there, there is a lot of stiff competition among pages to rank well on Google. Competitor keyword analysis, especially using the right keyword tools, will help you understand what your competitors are doing in SEO that’s working for them. You can then adopt relevant strategies, improve them, and gain a competitive advantage. And most importantly, you’ll be able to stay ahead of your competition, both as a business and on Google search. What is their digital presence like? Which pages of their website appear on Google’s page 1? Strengths – Which areas they do the best in? What are their hero products? What are they known best for? 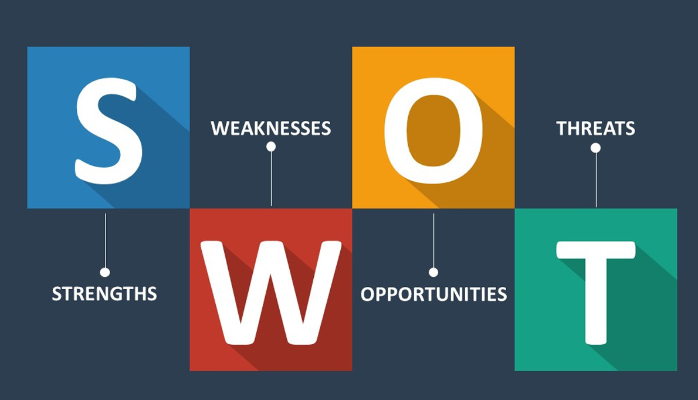 Weaknesses – What are the main weaknesses of their brand or product? Which parts of the market your competitor hasn’t covered or cornered yet? Opportunities – What are the advantages that your brand has over your competitor? Are there any opportunities in the market that your competitor hasn’t identified yet? Threats – In what areas do your competitor win that you don’t? Are they the go-to brand or thought leader in the space instead of yours? By performing this competitor analysis, you’ll be able to compare your strengths and weaknesses with your competitors. It will allow you to better position your brand or product by uncovering areas of improvements that you might not have thought about before. Competitor keyword analysis is part of the broader practice of keyword research. It’s the method of analyzing search terms that help to bring visitors to your website through organic or paid search. More importantly, with a thorough competitor keyword analysis, you’ll find keyword opportunity gaps. It’s the first step toward creating a more cost-efficient SEO campaign for your brand or product. Not only will it help to improve conversions, but also allow you to find new markets and optimize your marketing budget. Your competitor analysis will be an essential part of your marketing campaign as a whole and will provide the necessary data needed to craft an efficient SEO strategy. How do I categorize my business? What type of keywords are related to my brand? How do I make sure the keywords rank well? How do I get the highest ROI? Once you have the list of answers to the questions above, you will have a clear enough guideline to start your competitor keyword analysis. What can a good competitor keyword analysis give you? Marketing is not just about branding and well-designed landing pages. There’s a lot of analysis that goes behind it, and it’s no different than with search engine marketing (SEM). Improve conversion rates by finding relevant, low-competition but high-converting keywords. Optimize ad spend by distributing and prioritizing budgets toward better performing keywords and reduce spending on low-converting keywords. Identify trends from keyword research by learning about consumer and market behaviours, which can be applied to other parts of your business. As you can see, keyword analysis can be incredibly useful. It helps with fine tuning your marketing plans, ad budget management, and most importantly, create more effective SEM and SEO strategies. You can do it manually, which will take a lot of time and effort, or you can use a good keyword tool to do the competitor keyword analysis. The paid version of Keyword Tool Pro has a specific function that helps you to research keywords used by a competitor. Let’s say you’re operating an online store in the US that sells yoga-related apparel. And your biggest competitor that is dominating the industry is Lululemon. The results show that there are 658 related keywords to your competitor’s website. It also includes a list of keywords that rank for Lululemon’s website. From the list of keywords pulled from Keyword Tool Pro‘s Analyze Competitors function, not only will you see high-volume search terms that are relevant to your brand’s copy and content but also the industry’s customer search behaviour. You may have started the online yoga store by primarily focusing on women’s yoga apparel, but according to the data pulled from your biggest competitor, there seems to be a lot of searches for “lululemon men.” It clearly shows that there are also a lot of men who are either interested in or practising yoga. Another illuminating find is the high search volume for “lululemon bag.” Although it’s about half the amount of searches for “lululemon leggings,” it still indicates that there is a market for other types of yoga accessories. 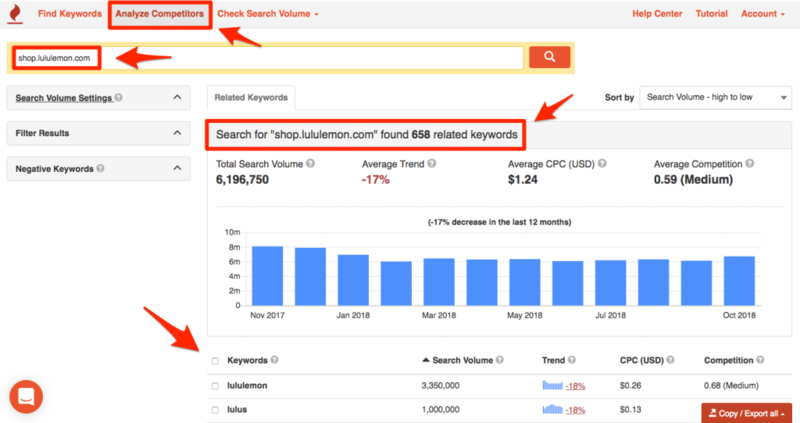 The different types of keywords that you can use to potentially “steal” organic traffic away from Lululemon by using these relevant keywords in your home page, landing pages, product descriptions, and blog section. 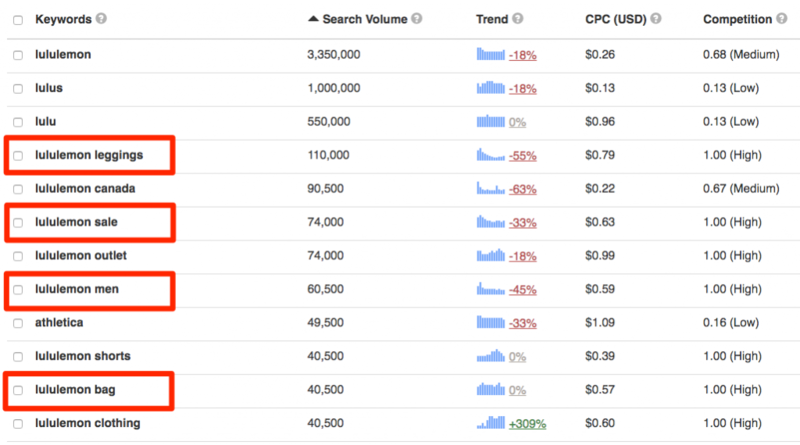 Diving deeper into this competitor analysis, you can also see search volume trends from the results. 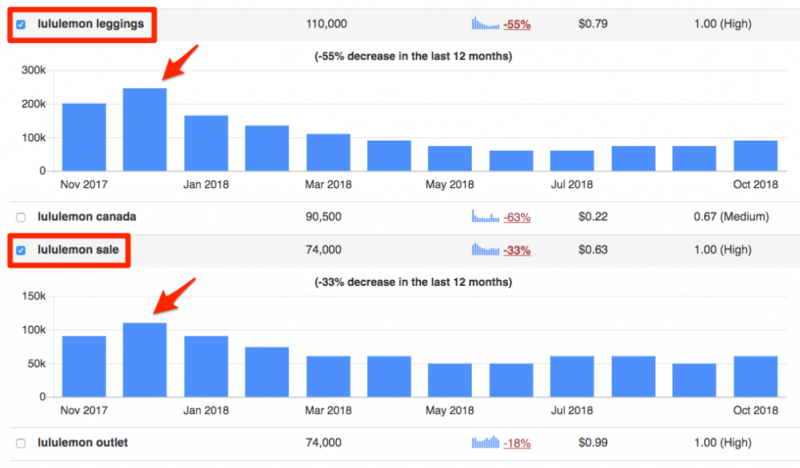 Do keep in mind that an increasing or declining trend shown on Keyword Tool Pro does not necessarily mean the keyword (or brand or product) is less popular. Depending on the nature of the keyword, it actually shows seasonal fluctuation. Based on the keyword analysis of your competitor Lululemon, it looks like the highest search of apparel type is leggings. When compared to the keyword “lululemon sale,” you can see a correlation of search trend between November to December. The correlation between high search volumes of “lululemon leggings” and “lululemon sale” might mean that yoga leggings are very popular. When allocating ad budget for your year-end Black Friday and Christmas campaigns, it may be a good idea to allocate a little more for your yoga leggings product sale. But your brand or product has nothing to do with yoga or Lululemon, you say? It doesn’t matter. Competitor keyword analysis works the same across all types of brands, businesses, and industries. As you can see even from this one small example, you can extract a wealth of data and learnings to apply to your business and marketing strategies. Never underestimate the power of competitor analysis, especially for SEO. 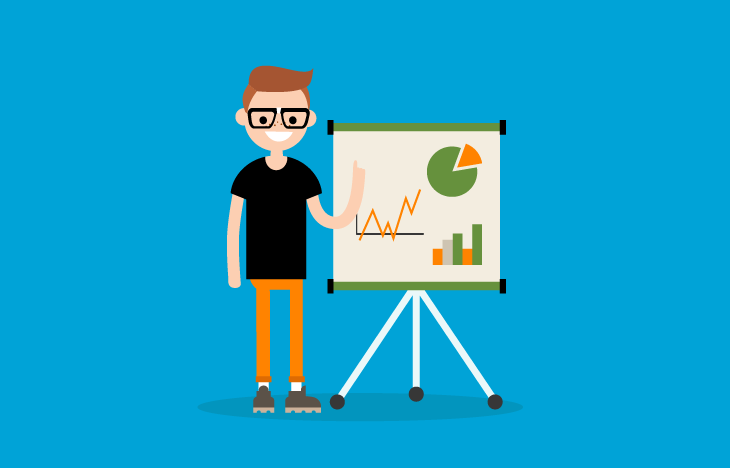 You’d be surprised at how big of a difference it will make for your marketing campaigns.